Survey shows universities have made efforts to boost Indigenous faculty, programs and spaces to bridge the education gap. In June, former judge and children’s advocate Mary Ellen Turpel-Lafond returned to academia to lead the Indian Residential School History and Dialogue Centre at the University of British Columbia, which opened to the public in April (Dr. Turpel-Lafond will also be a professor at UBC’s Peter A. Allard School of Law). “I want to make sure this is a place of dialogue that leads to change outside the university,” she said. The centre provides survivors access to their records gathered by the Truth and Reconciliation Commission and, she hopes, will serve as a place where they can record their stories outside of a courtroom. 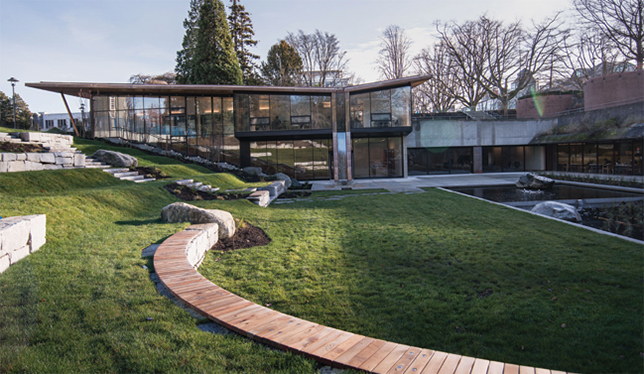 UBC’s Indian Residential School History and Dialogue Centre. Three years ago, on the heels of the TRC’s final report, 96 Canadian universities committed to a set of principles developed with Indigenous leaders to close the education gap and move toward reconciliation. Since then, the universities have taken steps to hire more Indigenous faculty and staff, create new Indigenous spaces such as the history and dialogue centre at UBC, and improve supports to Indigenous students attending university. New initiatives around Indigenous education have sprung up across the country in recent years. A 2017 Universities Canada survey of its member institutions, released this spring, found a 55 percent increase since 2013 in the “number of academic programs that include an Indigenous focus or are designed for Indigenous students.” Over two-thirds of institutions reported that they have Indigenous representation in their governance or leadership structures, and 60 percent have set goals to boost low Indigenous faculty numbers. According to Universities Canada, an estimated five percent of undergraduate students, three percent of master’s and PhD students, and 1.4 percent of full- and part-time faculty on Canadian campuses self-identify as Indigenous. At the University of Saskatchewan, where 2,400 self-declared Indigenous students were enrolled in 2017, the college of arts and science invited applications for 30 new Indigenous faculty positions last fall. “We know that recruiting Indigenous faculty members is an important commitment of the college and the university, but it was pretty obvious that our standard recruitment practices were not moving us ahead as quickly as we wanted to, so we felt we had to be more proactive,” said Lawrence Martz, vice-dean of faculty relations and a professor of geography and planning at U of S. “We also felt this needed to be a standing commitment,” he said, noting the 10-year plan adds new postings each year and includes faculty mentorship. At McMaster University, an Indigenous Health Initiative is underway with aims to recruit more full-time Indigenous faculty and staff, and to integrate Indigenous knowledge into programs throughout the faculty of health. “We expect all our researchers, educators and clinicians to have a comprehension of Indigenous perspectives and its relationship to their work,” wrote Bernice Downey, who is leading the initiative, and J. Mark Walton, associate dean, in a recent op-ed. In addition to recruitment efforts, 72 percent of Canadian universities offer on-campus activities specifically designed for Indigenous students, and three-quarters provide dedicated gathering spaces for these students, according to the Universities Canada survey. Among them is Laurentian University, which last year opened its Indigenous Sharing and Learning Centre, and in 2016 established the Maamwizing Indigenous Research Institute to promote decolonizing approaches to research focused on Indigenous communities. Another example is Mount Allison University’s Indigenous gathering space, Mawita’mkw, which is host to the university’s first elder-in-residence, Gilbert Sewell from Pabineau First Nation in New Brunswick. Meanwhile, the University of Alberta and Simon Fraser University have created designated housing options for Indigenous students and their families, and others such as Western University and Queen’s University have recently established Indigenous-centred residence floors as part of “living-learning communities” on campus. Despite the many steps universities have taken, many challenges lie ahead. “I think UBC is taking some good symbolic steps. But I think they, like all other universities, will have to do much better in terms of their own (Indigenous) student recruitment, retention and experience,” said Dr. Turpel-Lafond.